Sharing my craft with the world! I’ve joined a colour themed swap-bot swap where we have to make 3 ATCs: a pink, a brown, and a black and/or white one. As I have plenty of pink ones to choose from now, I concentrated on making the other two. The backing card was from a pack of random backings that I got in America. 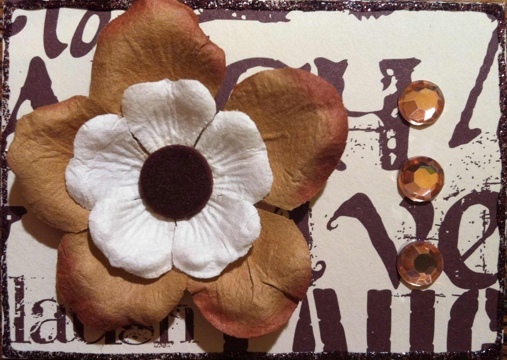 I chose a couple of paper flowers to fit in with the brown theme and held them together with a fuzzy brown brad. 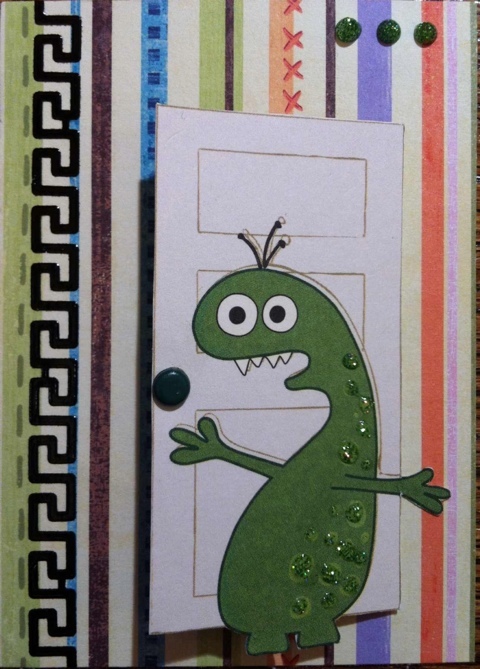 Then I added some brown adhesive gems, and edged the ATC with brown glitter glue. I’m really pleased with this one actually. Some handmade paper, artistically torn at the bottom, and a tree hand-drawn in white pen on a black background. 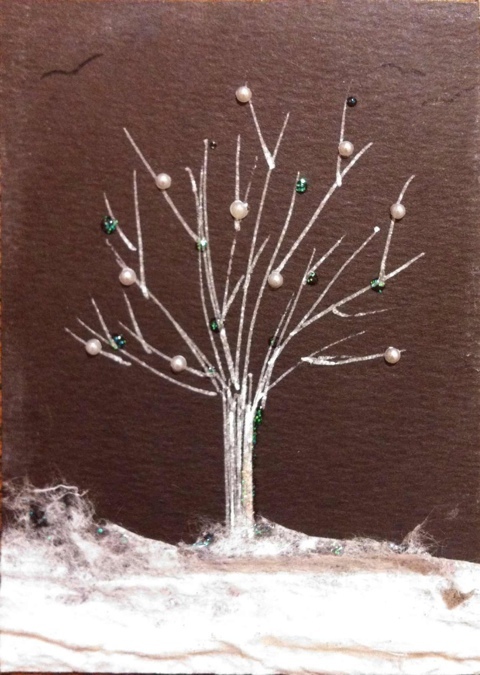 I felt it needed jazzing up a little, so I added some tiny adhesive pearls to the tree, and some iridescent glitter glue to the tree and snowy ground. In fact, I liked this one so much, I made another very similar. I may make one more actually, I have some gorgeous shimmery white felt that my friend Jay gave me. It’s crying out to be used on an ATC like this! I admit, that last one isn’t very apt for July, although with the weather we have been having, it’s probably not fat off! I need to start making the most of my blog as a tool for sharing my creations. I have been reading my friends blog a lot lately, and like the way she updates little and often, rather than all at once every couple of weeks like me! So I will endeavour to get blogging more regularly, but not deluge you with 100 ATCs at a time! 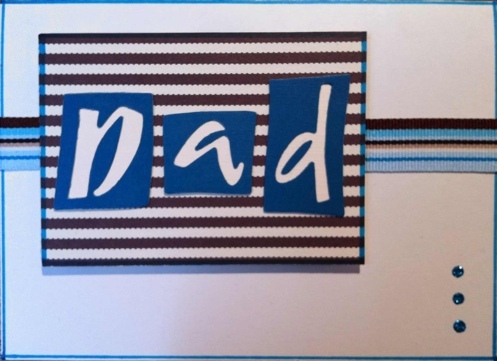 In my last craft update post I mentioned the Father’s Day cards I made. As they have been opened and enjoyed now I can share them with you! I made two cards the same, one for my dad, and one for my husband’s dad. I think I’ve been focussing on ATCs a bit too much though, because I really struggled for inspiration for this card until I made an ATC with ‘dad’ on. Then it all came together nicely. Adding a bit of ribbon and three glitter glue spots finished it off. 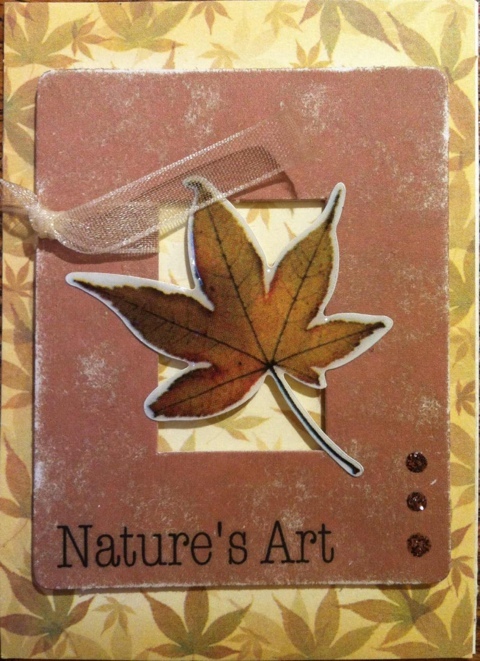 Since my last update I have been making ATCs with abandon. I will share a few today, then maybe some more later. He’s just so darn cute! He’s made with papers received from a swap-bot swap, rub-on letters, a border peel-off, a brad and errr, glitter glue spots again. I think I’m developing a makers mark! 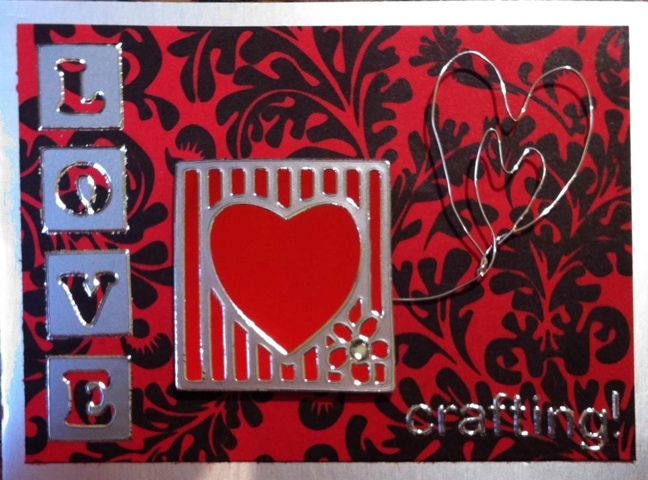 This is a very simple ATC made using some of the bits and pieces from the original ATC kit that got me started. I distressed the frame using a nail file over the surface, stuck a leaf shaped epoxy sticker over the centre, wrapped a bit of ribbon around the frame, and adhered it all to a matching background. Some rub-on words and the ubiquitous glitter glue spots finish it off. I’ve got about another dozen ATCs ready and waiting in the wings to go on the blog, so I’ll update again soon! This is a double edged blog post. Firstly, I have recently joined a couple of blog-based Swap-Bot swaps, so I would like to say hello to Evey, Holly, Marie, Lori, Mercedes, Steph, Amanda, Beverley, Tajuana, and of course my good friend Jay who are my partners for the ‘Quickie Blog Swap’. Please have a nosey around my blog (I’m pretty new to it all, so it’s only little, but growing rapidly!). And I would also like to say say hello to my ‘Host a Blog Giveaway’ partners Evey (again! ), Angelina and Courtney, all of whom will be hosting their own giveaways (more about that in a later post though). It’s an ATC I made with some of the contents of the first Swap-Bot package I ever received (you can see more about it in my ‘N is for…’ post from April). It’s one of my favourites, and I had been going to keep it for my own collection, but ATCs are meant for sharing, so it’s going to be given away to one lucky winner! The rules are pretty simple. To enter my giveaway all you need to do is comment on this post. However, if you want an extra entry, you can follow me on Twitter and tweet a link to my blog (please copy me in on the tweet though so I know you’ve done it!). The maximum number of entries will be 2 – one for commenting here, and one for tweeting my link (you have to follow me too for this bit – I will be checking!). Please let me know your Twitter name in your comment too, it will make my life so much easier! You don’t have to be a Swap-Bot member to enter – anyone can win. The winner will be chosen on June 20th using a random online generator (assuming I can suss out how to use one!). Thanks for reading, and good luck in the giveaway! I’m hosting a Swap-Bot swap! Well, this isn’t craft related, but I’ve blogged about Swap-Bot enough on here to be able to justify this I think! I am hosting my first swap on the site, and am really looking forward to seeing the results. I am offering a healthy recipe email swap as we are on a real health kick after eating so much rubbish on holiday! I’ve set the sign-up date as July 1st. I wanted to make it the weekend earlier, but as that’s my son’s birthday weekend I may already be quite busy then! The swap needs to be sent by the 10th July. Each swapper will have 10 partners, and we each send one recipe to those 10 people by email. I’m hoping that at the end of the swap I will have 10 nice new healthy recipes to try out, as I am struggling with the small selection of recipes in my repertoire at the moment. As host of the swap, my responsibilites are simply to monitor the people who sign up to it, to ensure that they are likely to complete it. I also have to initiate the allocation of partners. This is done automatically by the site, but I have to check the swappers first and set it into motion. I also should check up towards the end of the swap date to make sure everyone has sent their swap, and prompt them to do so if they haven’t. If this swap goes well I will probably consider hosting a few more, maybe another recipe swap, or even a craft based one. But before all that I need to make sure this one goes well first, and that’s where you come in! My friend Jay at Jay’s Insight has joined, now it’s your turn! American adventure (in a craft store)! I purchased 3 new scrapbooks (one 12×12, and two 8x8s), a pad of 8×8 papers, some 12×12 patterned papers, some 12×12 plain cardstock, some random sized and patterned card, a couple of packs of notecards, a notepad, some stamps, paper flowers, adhesive gems and pearls (really looking forward to using those! ), glitter glues ($1 each, I couldn’t resist! 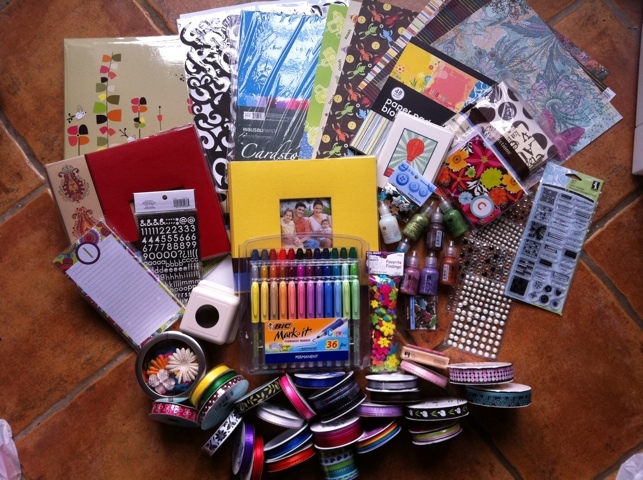 ), flower buttons, star buttons, flower brads, sparkly letter stickers, a Martha Stewart punch-anywhere-on-the-page circle punch, and a huge pack of 36 gorgeous coloured permanent marker pens. Oh, and a few ribbons. 116 yards of it to be exact. I *may* have gone slightly overboard with the ribbon. But just look at them! They’re sooooo lovely!! Since I’ve got back I’ve joined another Swap-bot ribbon swap, so I’ve already cracked some of them open to send off to my swap partner. 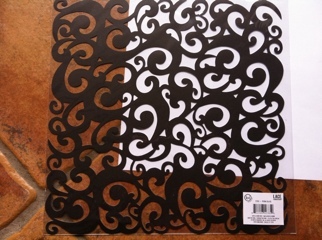 One of my favourite purchases is this —> which is a 12×12 lacy scrapbook paper. I had to put some white paper behind just half of it to give you the true of idea of how gorgeous it is. I’ve seen a beautiful layout using one of these in the past, and I’m really going to have to put some work into whatever I make with it to do it justice. I’ve not had any time for crafting since I’ve got back, although I have loads of ideas running through my head. Hopefully over the next few days I can get some time in the craft room and get some stuff made. I have a few birthday cards I need to make, plus Father’s day is coming up rapidly, so I need to get going! Although I haven’t been blogging this week (completing that A-Z challenge was hard work!) I’ve still been busy crafting. I went a bit mad at the start of the week and joined three new swaps on the Swap-Bot website, all ATC swaps. Most Swap-Bot swaps are international, but I managed to find a UK only one, which helps to save on postage a bit. Two of the swaps, the UK only one and a ‘quick’ swap (where you only get a few days between being given your partners name and having to post out) were free theme. However, for the other swap the ATC made had to follow the theme of ‘red’. This is quite a wide ranging theme, which was good for me as I’ve never done a themed ATC before. My problem generally is that my finished ATC often bears little or no resemblance to the one that was in my head at the start! And in fact, that was the case with this one too! 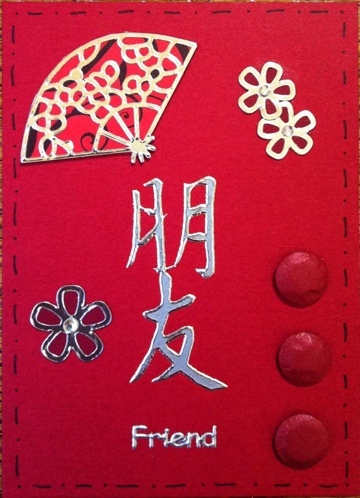 I used some peel-offs and papers that I’d received from a previous swap, plus a chinese word peel-off, and some Card Candy. I basically gathered up as much red stuff as I could find to begin with, and worked from there. I was pleased with the end result, and got the ATC posted off to someone in the States at the start of the week. For the UK only swap, I used an ATC I’d already made. When I looked at the profile of the person I was sending to I saw that she liked daisies and the colour green. As I had a green daisy ATC already, I used that. The final swap I found more tricky. Although it was free-theme, I like to look at my partners profile and send them something they’d like. My partner for the ‘quick’ swap was quite young and fashionable, and liked fluorescent colours. Now, as I did fluorescent colours the first time round in the 80s, I’ve really not got into it this time round! As such, I honestly thought I didn’t have anything that would work. However, after a good dig around in my stash, I discovered some brilliant double sided card – bright pink on one side and lime green on the other – perfect! I used a mirror I’d received from my very first swap, and decided to embed it in layers of the card – this was far more complicated than I expected! I have a craft compass, which has a blade instead of a pencil at one end. This enabled me to cut the perfect sized circle in each sheet of card fairly easily, although it took a little while. 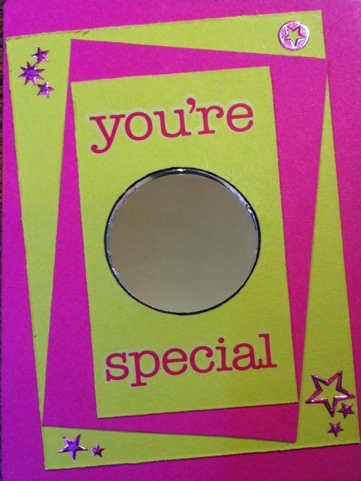 I found a ‘you’re special’ rub on which was a very good colour match, and then coloured a few star shaped peel-offs pink to match as well. The finished ATC is very different from anything I’ve made before, but it was good to try and push myself to do something slightly out of my comfort zone. So, as if all that wasn’t enough, I’ve joined two moe swaps this weekend. The first one I’m really looking forward to – it’s a ribbon swap! We have to send 6 x 12″ lengths of ribbon to our partner. I’m really excited about what I’m going to receive! Finally, one more ATC swap, another quick one. I got my partners name yesterday, and I have to post the ATC by Wednesday. More red, and more peel-offs on this one, but after re-discovering my craft wire last week after doing one of my A-Z posts, I’ve used some of it on here. I’ve still hardly made a dent in it – I have so much left I think I could put a craft wire embellishment on everything I made from now until the end of the year and still not use it up! To use craft wire properly you should really use special shaping pliers, which I don’t have. So the hearts were made by hand, hence the fact they’re a bit wonky. 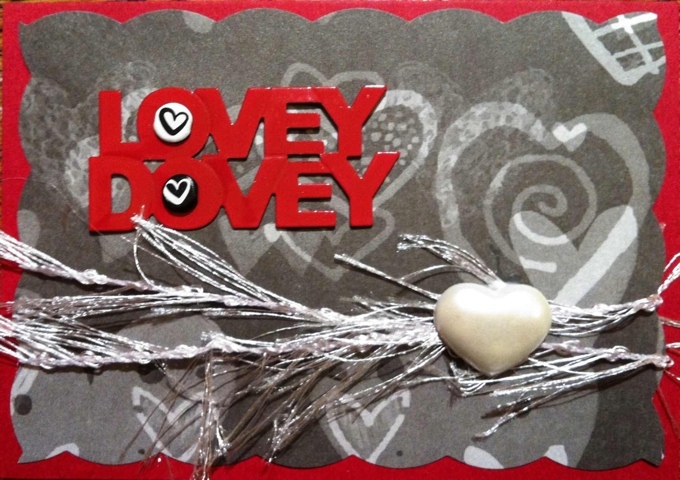 I’ve always struggled with how to adhere the wire to the card – if you use glue it’s going to be pretty obvious – but with this ATC I used the cunning ploy of sellotape hidden by the peel-off heart. 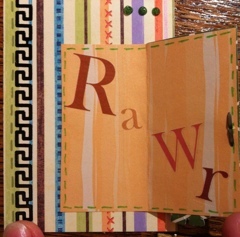 I’m really looking forward to starting a collection of swapped ATCs. It’s lovely to see somebody else’s designs, and how they use different techniques. At the end of my ‘Z is for…’ post I asked for ATC challenges. I received three good ones, which I have been working on today (I will show you when they’re done, don’t worry! ), but would love some more. So please, what would you like to see on an ATC? I’m looking for any sort of theme, from the simple like ‘red’, to the more difficult, like ‘stressed out’ (cheers Michelle!). Give me something to get my teeth into!